home/ » HOW ARE MODULAR HOMES BUILT? There are lots of different construction methods to build a home but most of them share onething in common – most of the work takes place on the building site. But the modular home is different because much of the work is done in the factory where the modules are created. So how are modular homes built and what are the benefits of them? What is a modular or offsite home? A modular home is one built inside a factory with the finished products then covered in protection and transported to the building location. They are then assembled by a builder to create the finished property. Modular homes aren’t mobile homes – once they are built, they are not designed to be taken apart and moved. They simply replace the building on-site with building in a factory. Modular homes are also different from manufactured homes. The latter are not placed on permanent foundations and are sometimes similar to mobile homes. Manufactured homes can sometimes be moved around depending on size and type. Because modular homes are made in a factory, they take a lot less time than other types of homes. In fact, a standard property can be built in as little as 1-2 weeks. Another big advantage is that the weather doesn’t stop the work – it can be raining or snowing, and the factory can continue to producethe home, while work on site would have to stop. Once the home is constructed, it usually takes another 2-4 weeksfor the builder to put everything together once it reaches the site. What makes modular and offsite homes popular? There are some solid reasons why more people than ever are consideringmodular homes for their new property. For starters, they can be fully customised to suit your needs. Most companies producing these properties use the latest in Computer Aided Design software (CAD) as well as engineer departments to help make everything perfect. These homes vary greatly in size and style and can also be used for commercial properties such as office buildings. As far as getting a mortgage, modular homes aren’t treated the same as standard built properties. That’s because even though they are manufactured different, they are still a permanent structure once they are in place. They are a ‘real’ house that is just constructed differently. Modular homes often tend to be a lot more energy efficient than a standard home. There are also companies that specialise in sustainable or eco-friendly designs so if this is a central concern, you can look to work with a company specialising in this. Are modular and offsite-built homes cheaper? Modular homes can be more cost-effectivethan standard properties, mainly due to the time involved with building them. Where a normal property might take months to build, a modular home can be finished in a matter of weeks after it is constructed in the factory. Obviously, you still need to buy the land and pay for all the other workmen involved in the project, but the time scales can definitely save you money on the overall project. Metrotile’s lightweight roof tilesare perfect for modular roofs. 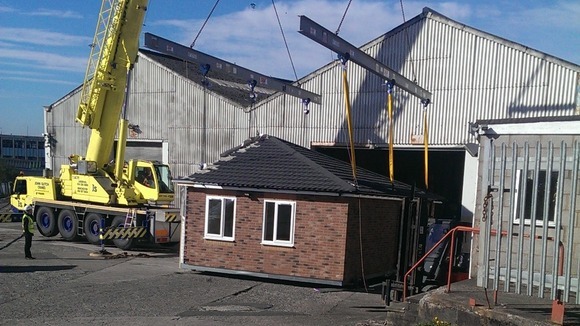 As they are up to seven times lighter than traditional roof tiles they can be moved around much more easily lending themselves to modular homes perfectly. Find out more about modular homes and roofing, get in touch with Metrotile by calling us on 01249 658 514 or you can fill in our contact form.